First of all, there is no such thing as a “rest” day while on the trail. Two rest days, one at Namche Bazaar and the other at Dingboche built into almost all EBC itineraries are grossly misleading. 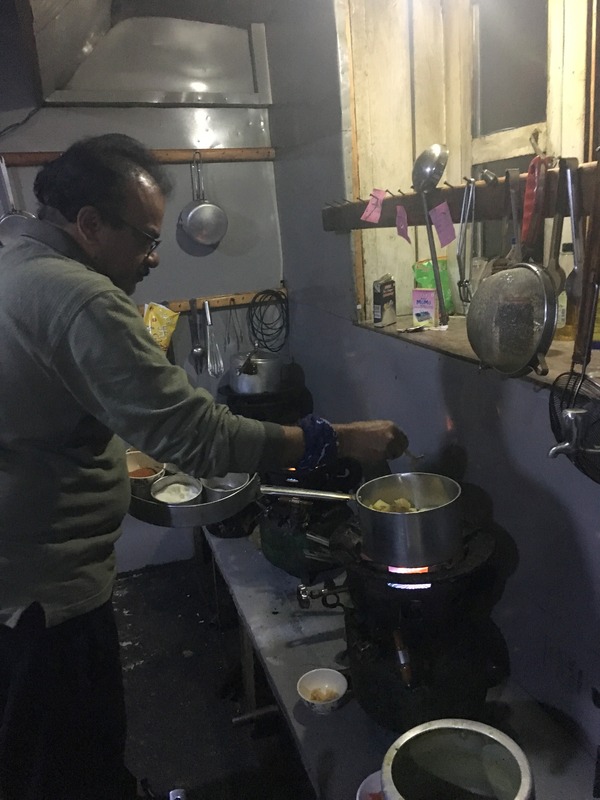 If you are thinking about spending a cozy day hanging out with your buddies over a cup of tea (or a glass of beer) next to cow dung fired teahouse stove, forget it. The rest days are actually acclimatization days where you “hike higher and sleep lower” as my guide said. We would spend a “rest” day here to allow our bodies to adjust to higher elevation to avoid altitude sickness. 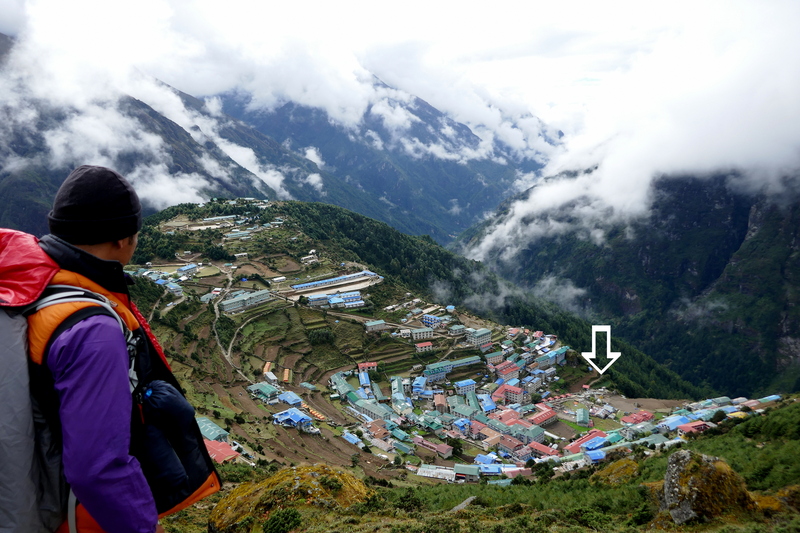 Namche Bazaar is at 11500 ft – which is higher than Machu Picchu if you have been to that trek. As always, the first thing I wanted to do after arriving at our hotel was to take a hot shower. We were on third floor of the hotel and there were only two shower stalls, on the first floor next to the hotel dining room. I had to stand in a line for about 30 minutes before I got my turn. It is best to take shower before you settle in your room and unpack for the night before everyone else is ready for it. 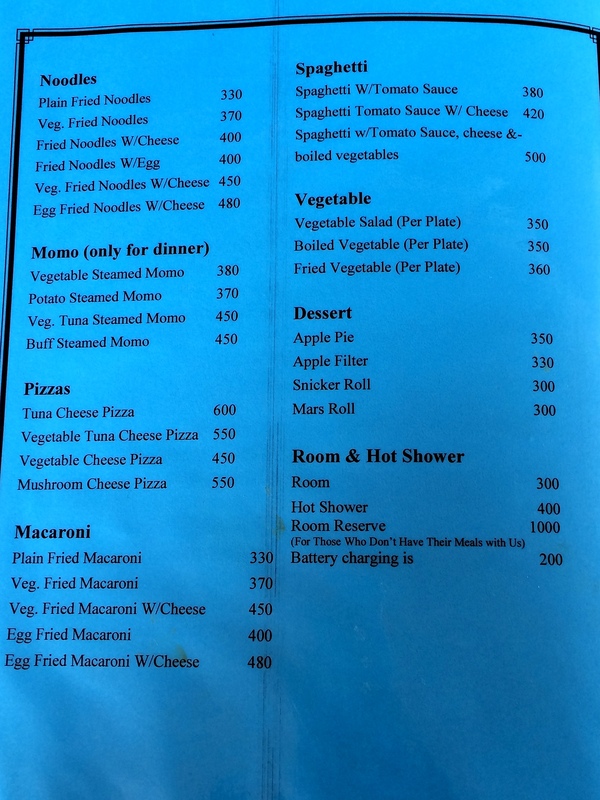 Closer to the dinner time is the busiest time for shower and you may be out of hot water by then as all the staff is busy in kitchen and not attending shower heater (wood or LPG fired). We checked into Hotel Nest around 5 pm yesterday and as much as I wanted to go explore the town and look for a storage card & battery for my camera, I didn’t feel like going anywhere as I was very tired. The thick Himalayan fog starts rolling into the town around this time and all the hikers have settled into their rooms so the shops starts closing so it was no point going out. Namche Bazaar known as the capital of Khumbu Valley is at a mid-point between Kathmandu and the base camp. This is the last place on the EBC trek where you will find the amenities of civilized world. There are restaurants, gift shops, bars, bakeries (including a German Bakery! ), laundry facilities, barbers, and we even spotted a sigh saying North Face coming soon! Tshering told me that several wealthy Sherpas, who have made a fortune from the mountaineering & tourism business, live here and send their kids to schools in western countries. 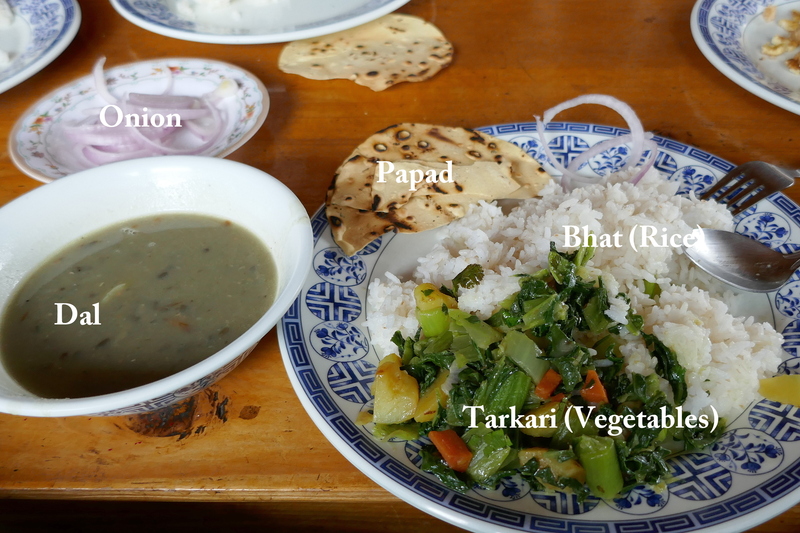 Anyways, after a (relative to EBC trek) nice shower and usual Dal Bhat dinner, I was ready to call it a day. Even though I was tired from a very long day yesterday, I didn’t get a good sleep last night – probably due to the side effects of the Diamox on my first night at 11500 feet high elevation. Same thing with my roommate – Kamlesh. Next morning, we woke up early and by 6:15 were on breakfast table. Kamlesh said “something is happening to him but he can’t tell exactly what”. Hmmm – looks like an early sign of altitude. 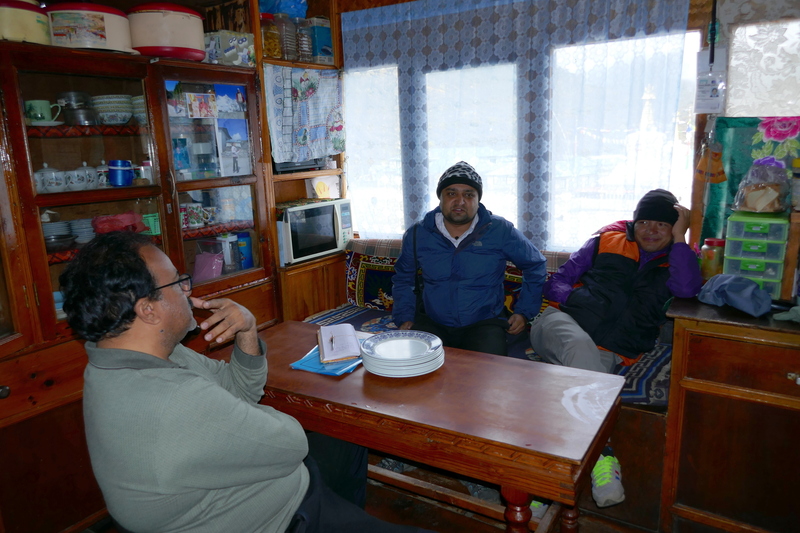 After consulting Doctor Saheb – he started taking Diamox with our first breakfast on the EBC trail. As you will learn, our breakfast routine was pretty much the same everyday. Between six of us, we order a few omelets with toasts (when available) and supplement with yummy Theplas, Bhakharis, and power packed Sukhadis. 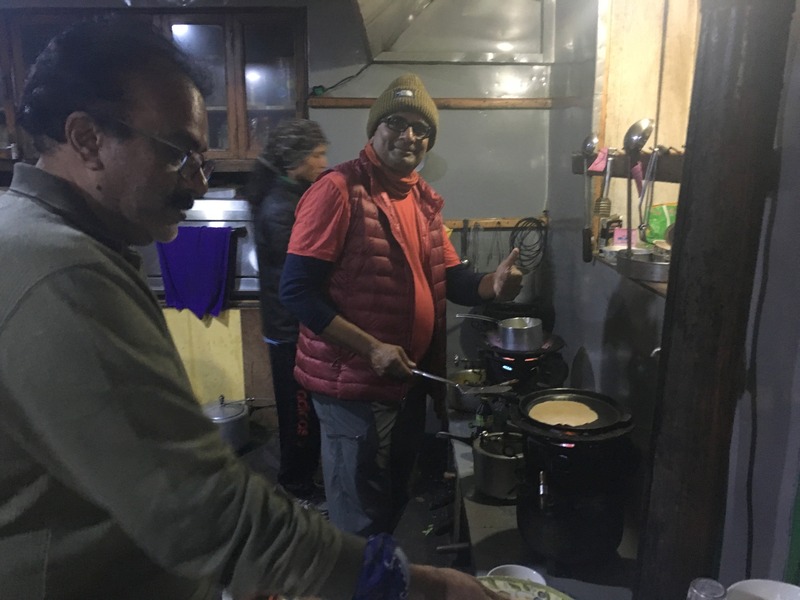 A couple of times, we tried pancakes – chapatis – and other items but kept coming back to the routine. I had brought some instant masala chai packs and enjoyed them every morning throughout the trek. After our morning chores, we were all ready for our acclimatization hike to the Everest View Hotel and started our day with the usual group pictures. 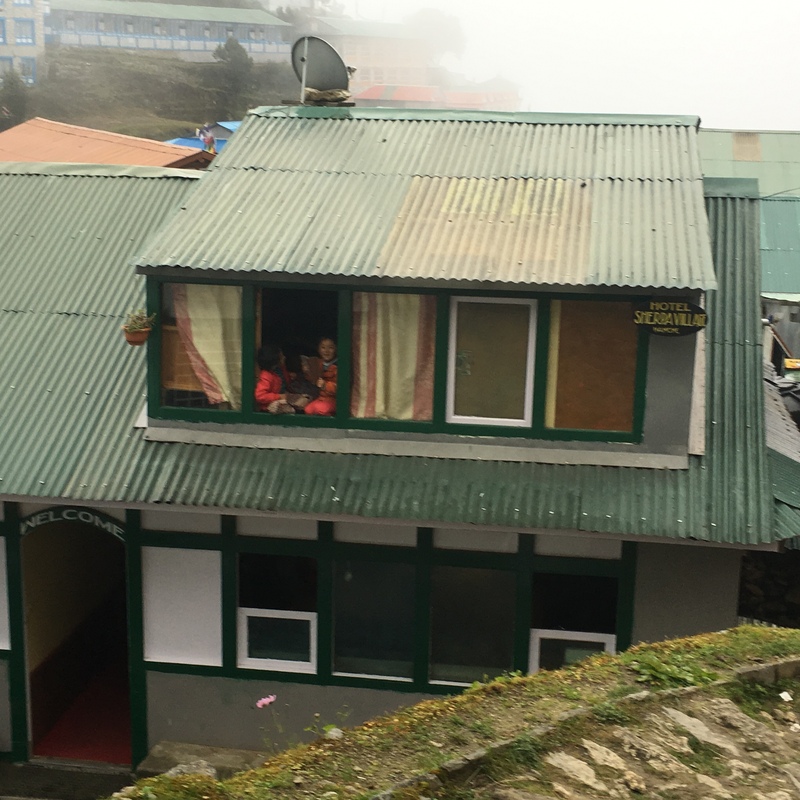 Our acclimatization hike to the Hotel Everest View on the “rest” day started out in cloudy weather and we slowly made our way through the town on narrow uphill trail with steep stairs. Basically, pretty much everyone one does this hike on their “rest” day so we had company all along the trail. I was so tempted to look around for my camera batteries and storage card but Tshering promised me to take me to his friend’s shop on our way back. It was only about 15 minutes hiking some of the steep stairs of Namche Bazaar and I am out of breath every few meters! I started wondering what’s going on with me? Is it the altitude sickness? Yesterday, I hiked through the infamous Namche Hill but I found today’s hike more strenuous. As I look around, there were many small groups before and after us and the fact that seeing others also struggling made me feel confident – strange! In about 20 minutes, we come to Tashi Delek Monastery from here the trail splits – one the right goes towards Tengboche (that we will be taking tomorrow) and left goes towards the Hotel Everest View – about 400 meters up from Namche Bazaar. The path leading to the monastery is lined with mantra stones and prayer flags offered by the local people on various auspicious occasions in their families. The monastery is beautifully decorated with red-yellow-muted blue colors and prayer wheels on either sides of the building. I really wanted to go inside to explore but others from my group were hiking ahead and my guide said that the monastery may not be open for drop-ins at this time but we will try on our way back. By then we were risen well above the Namche Bazaar town roofline and started seeing beautiful amphitheater like aerial view of the town – something we will enjoy over and over again till we reach at the top of the hill. There are several rock outcrops and Buddhist shrines along the trail to the first hill providing gathering/rest points and we took many pictures there. After an uphill hike for about 20 minutes, we came to an abandoned airstrip. While resting at a small shrine like structure, I met an Israeli couple who had a large map of the EBC trek spread on the ground trying to figure out their way to the Hotel Everest View (they were hiking without a guide). At this location there were several paths going all over and it was confusing. They saw some people hiking on a trail going towards left side so decided to follow them. After they left, I asked Tshering if that was the right trail and he said they all connect further up. Tshering lead me through a small opening in the deserted airstrip fence saying this is a short cut. The trail didn’t look “official” – it was a very narrow path lined with dense shrubs. I was a bit skeptical if it was the right trail but after walking a few meters saw some locals with their shopping baskets and some school children with their school bags on the trail so felt reassured. By then, Namche Bazaar starts disappearing behind a shroud of thick clouds and the landscape changes with colorful foliage. Along the trail there are few shrines providing a nice vista point and rest areas. From this point, it took us about 45 minutes to reach the Hotel Everest View through a gradual uphill trail covered with fog. Trail to the Hotel Everest View. (c)SherpaValley. Within 30 minutes or so, we are at the footsteps of the Hotel Everest View. Situated on a ridge overlooking the Everest range, Hotel Everest View is perhaps the highest placed hotel in the world (13000 ft elevation). 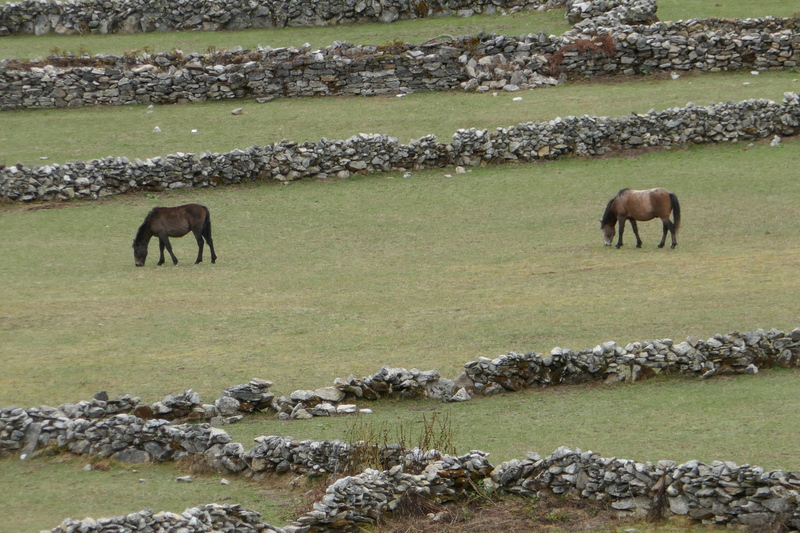 It is a popular destination for the EBC hikers passing through Namche Bazaar. Click here visit their website. Photo ritual at the Hotel Everest View. (c)SherpaValley. 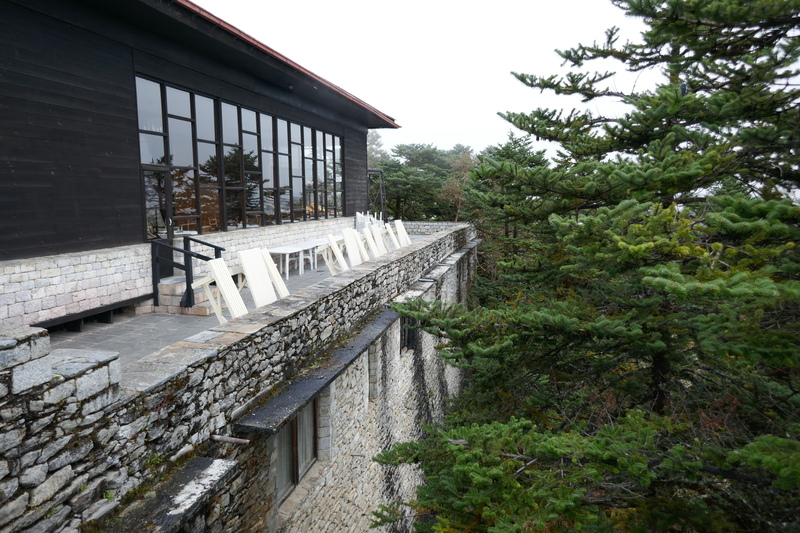 It is so nice that they allow all visitors to access to their terrace from where you get the best view of Mount Everest – weather permitting! When we were there, the Everest range was hiding in a shroud of thick clouds so there was no view of the Mt. Everest from the Hotel Everest View! We had a nice break there for some tea and french fries. There were not too many hikers when we were there so it was very quiet. 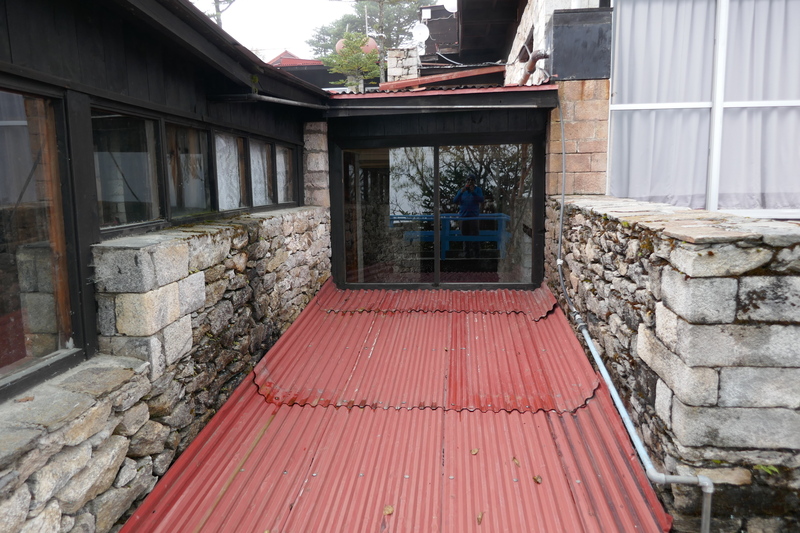 We explored the hotel, took many photos, and chatted with a russian couple who had seen Mt. Everest from here in their prior trip. Click on any image below for larger views of the hotel. There was a plaque there honoring Keizo Miura, a pioneer Japanese mountaineer and photographer.Hotel lobby has a nice display of beautiful photographs of Himalayan mountains by local photographers. After a refreshing break at the hotel, we head towards the town of Khumjung on our return trip to Namche Bazaar. 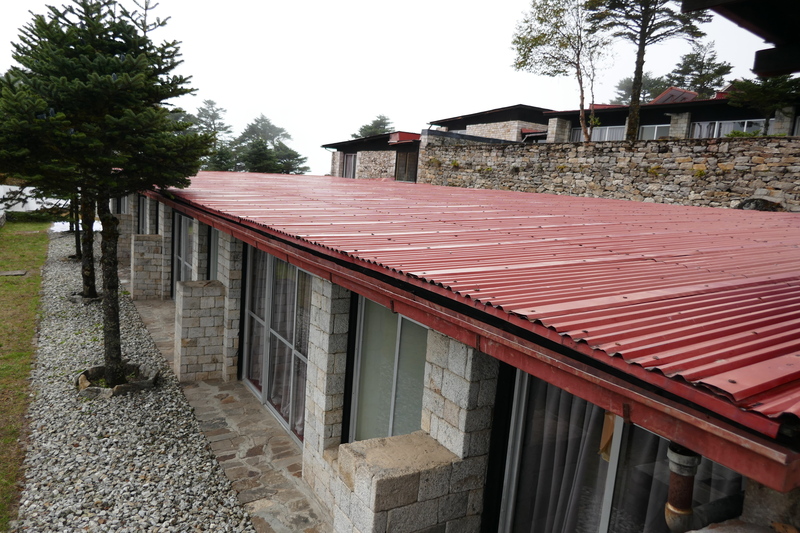 Khumjung is famous for three things: (1) A monastery claim to have Yeti scalp, (2) Khumjung school (“HIllary School) built by Sir Edmund Hillary‘s Himalayan Trust in 1961, and (3) Green color roofs on all houses. Trek from the Hotel Everest View to Khumjung is a relaxing 40 minutes downhill walk. We stopped at a rock outcrop and a buddhist stupa to take some photos. 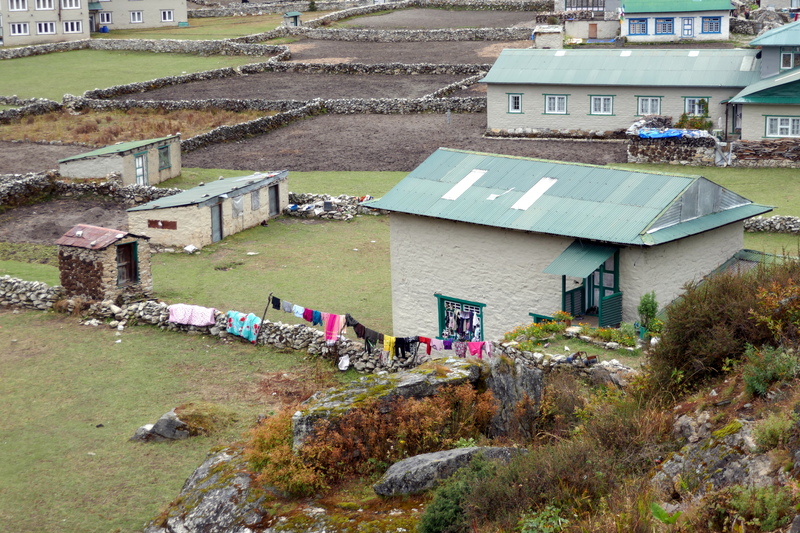 I asked my guide Tshering (who spent two years in Khumjung as a chef) why all the homes in town has similar green color roofs but he could not come up with any convincing answer. 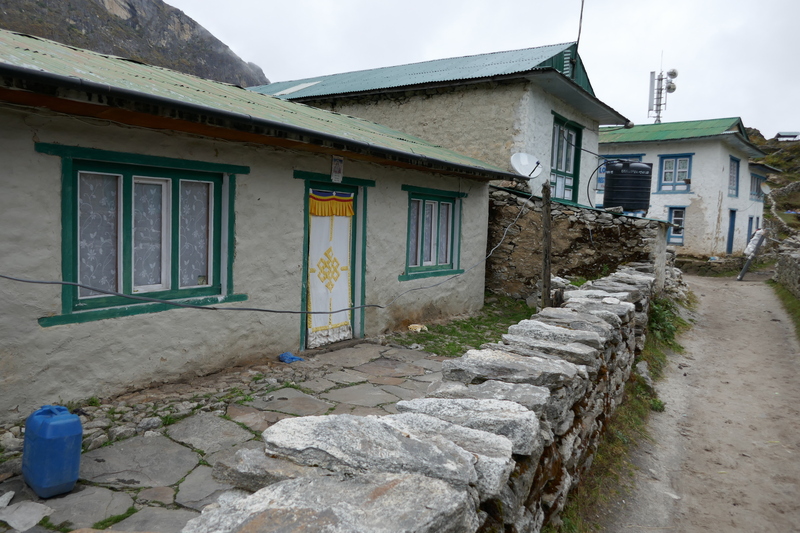 The narrow street entering Khumjung village has small gift shops on either side selling handcrafted items and souvenirs. It is a remarkably clean town with stone build homes on either sides. 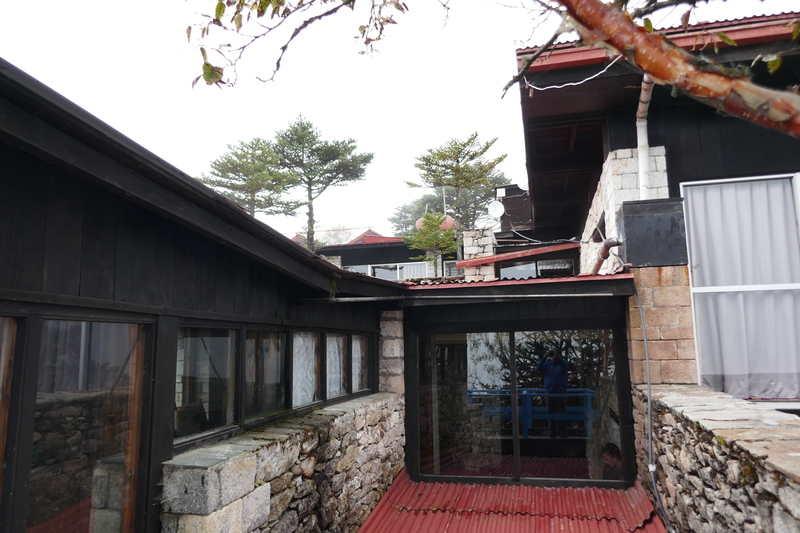 Since it’s not on the EBC trail, there were very few hotels or teahouses with overnight stay facilities. There is a large Buddhist stupa at the center of the town with open ground. The prayer stones make a nice center point at street junctions. 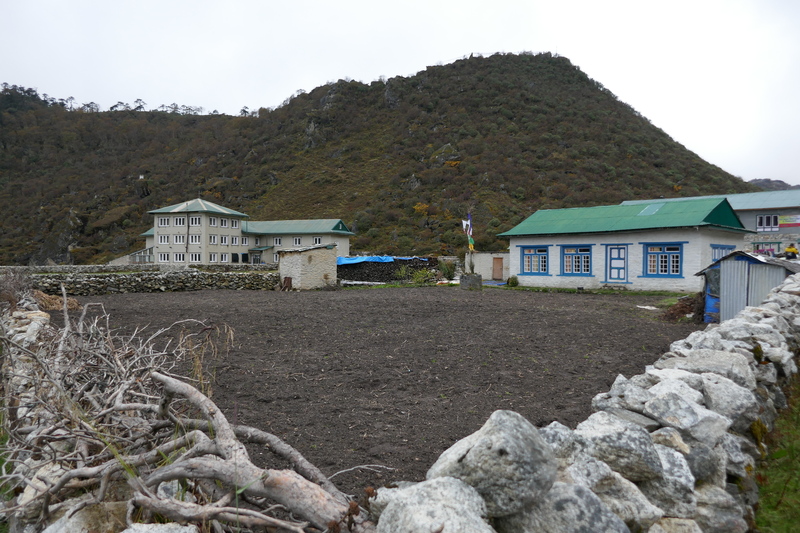 We arrived to Khumjung around noon and visited the Hillary School and explore the village.There is also a statue of Sir Edmund Hilllary near the school. 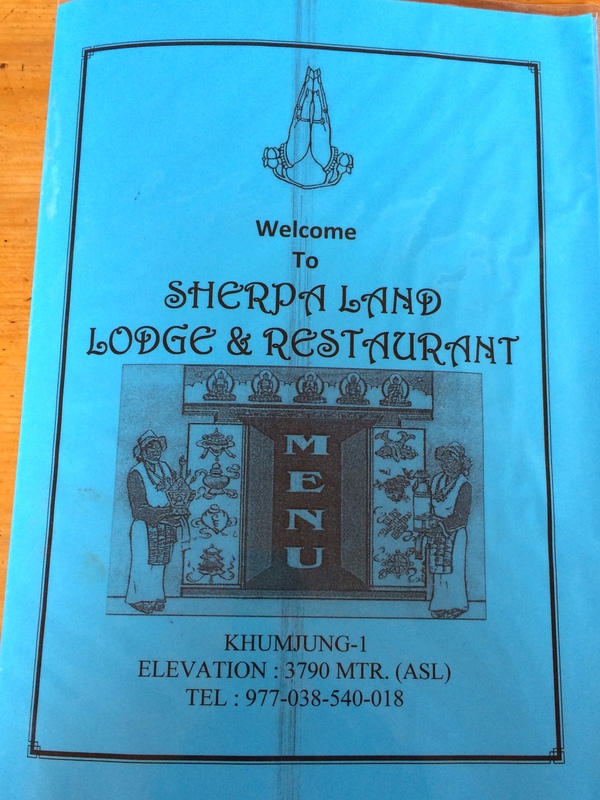 After a stroll through the town we found Sherpa Lodge and Restaurant and after looking at the menu we decided to have a lunch break there. 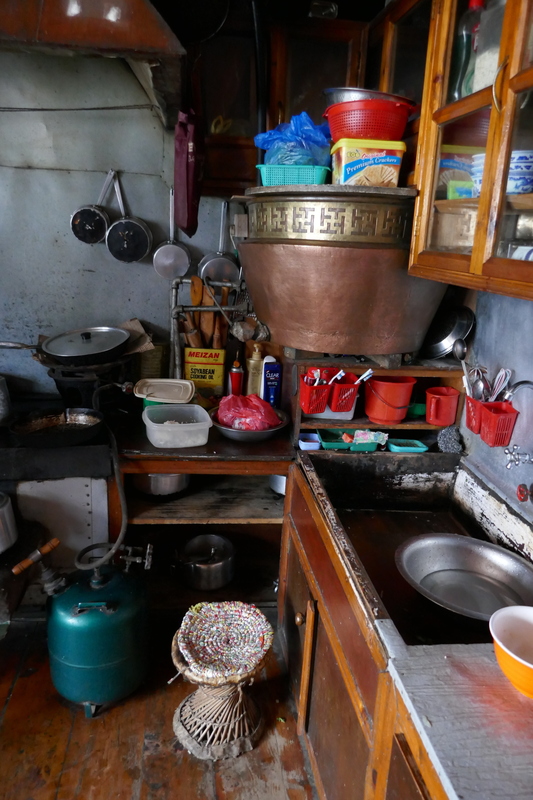 The way it works in this part of the world is that they generally don’t keep any “ready-made” food and there are no refrigerators so cooking starts after you order your food which takes an hour or so. For a foodies like me, this is a heaven. Almost all the food is made from scratch, locally sourced, mostly organic, and slow cooked. It can’t get any better! While we are hanging out in the Kitchen smelling all the aroma of freshly made meal for us, rest of our team is taking unplanned siesta. 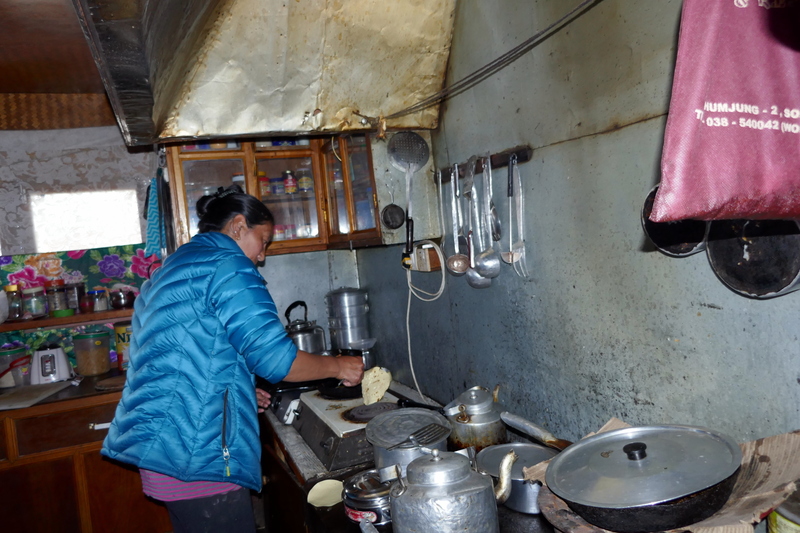 Typical setup of a teahouse (or lodge or hotel – they are basically the same) on the EBC trek is that there is large dining room with wooden surfaces and a stove in the middle providing the only source of heat. The stove is fired with a mixture of cow dung (as a starter) and some wood. You will see buckets full of dried cow dung patties and small firewood stored inside the teahouse or in a separate room. 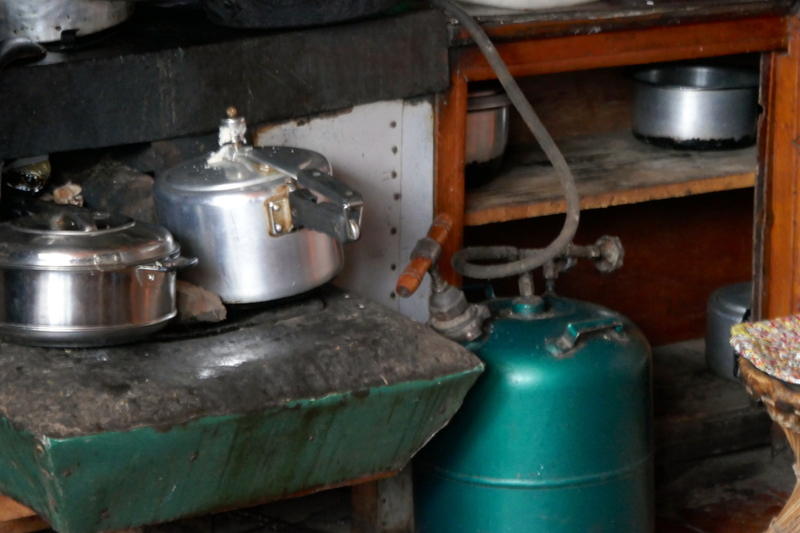 Hikers gather around the stove (which is only fired in the evening) and share stories while sipping hot tea or coffee. I have also seen hikers drying their towels, socks, hats, etc. During peak season, the dining room is also used to sleep people when they run out of room – generally no one is turned down at the lodge as there is no other place to sleep overnight. I do recall our guides and porters had to sleep in the dinning room a couple of times up the trail as they didn’t have any space in the rooms or common dorms available. Bottled water, adult beverages, soft drinks, water, chocolates and other items are available to purchase at the main counter. 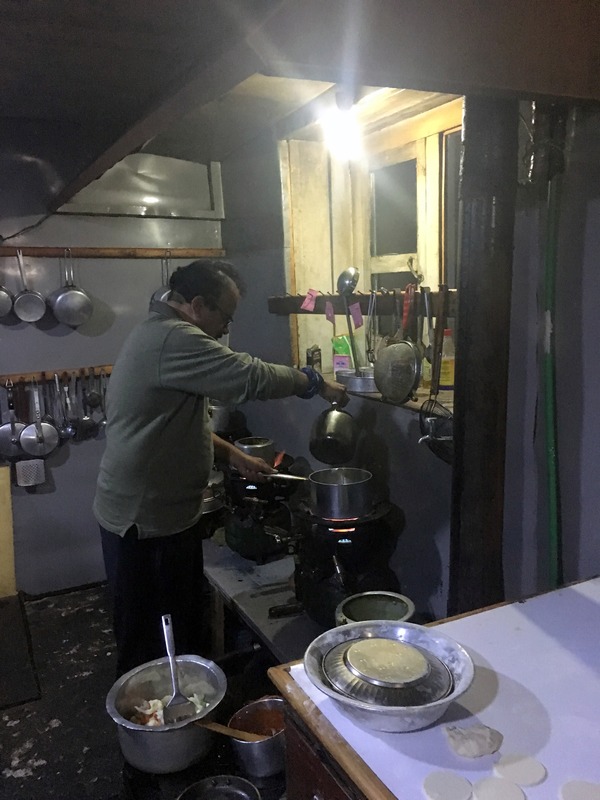 When we reach at any teahouse, our typical drill is to first order the food and/or try to see if they allow us to cook our own meal in their kitchen, have our guides take our cellphones and camera batteries for charging at the main desk while we are waiting for the meal. Our guides carry a small notebook where they record all the purchases, including battery charging and hot showers not included in your room rental and settle account at checkout. The hotel staff keep trek of your purchases by your tour agency’s name when you go to purchase a bottled water or charge your cellphone without your guide. The cost of goods and services in this region is interesting! 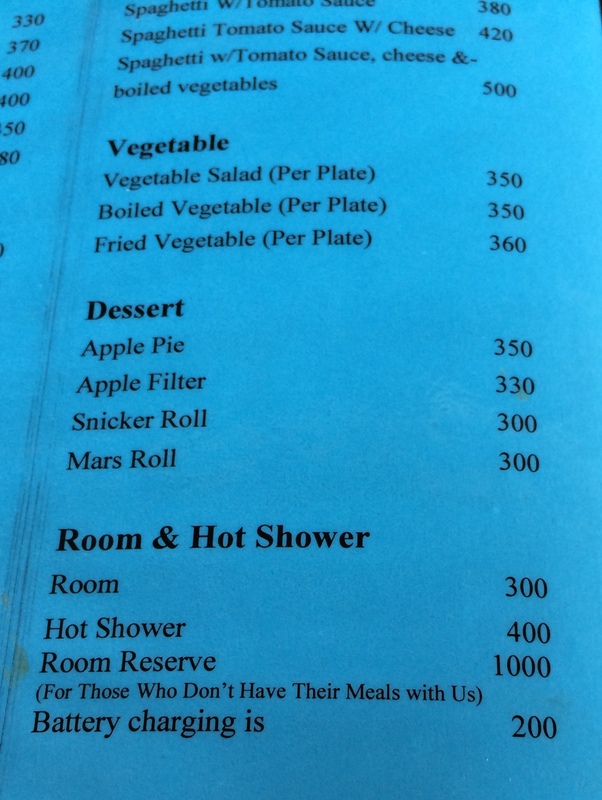 For instance, the room rent is NPR 300 (1 US Dollar = 108 Nepali rupee as of Dec 2016) but the hot shower is an additional NPR 400 and battery charging is NPR 200. 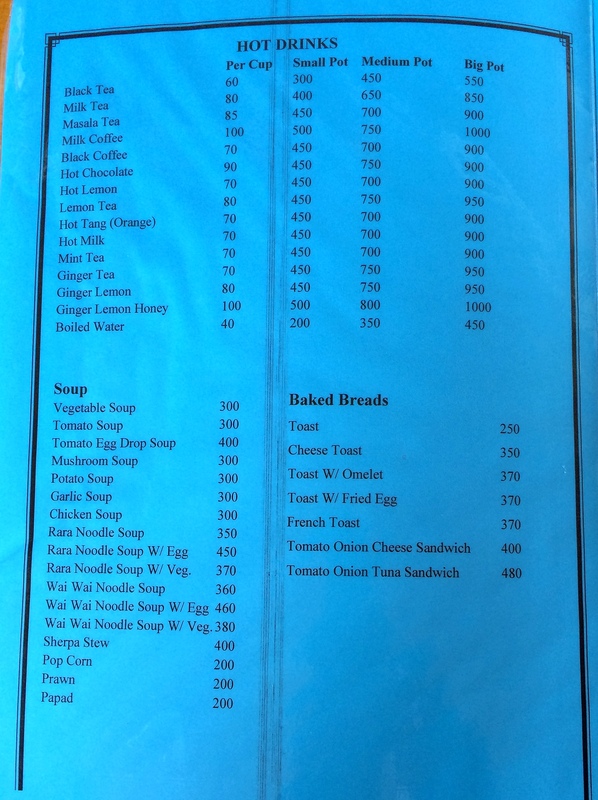 If you don’t eat at the same teahouse where you live the room rent is NPR 1000! The electricity is scarce and generally comes from Hydro or Solar plants. It may take a while to charge your cell phones or camera batteries to a full charge and there is a competition with hikers using a variety of gizmos – from cell phones to cameras to portable GPS to.. the list goes on an on. No wonder there is a movement going on to offer “digital detox” retreats in western world. In my case, I refrained from using my cell phone (except absolutely necessary to connect with my team or family) but had to use my camera to capture my EBC trek experience. 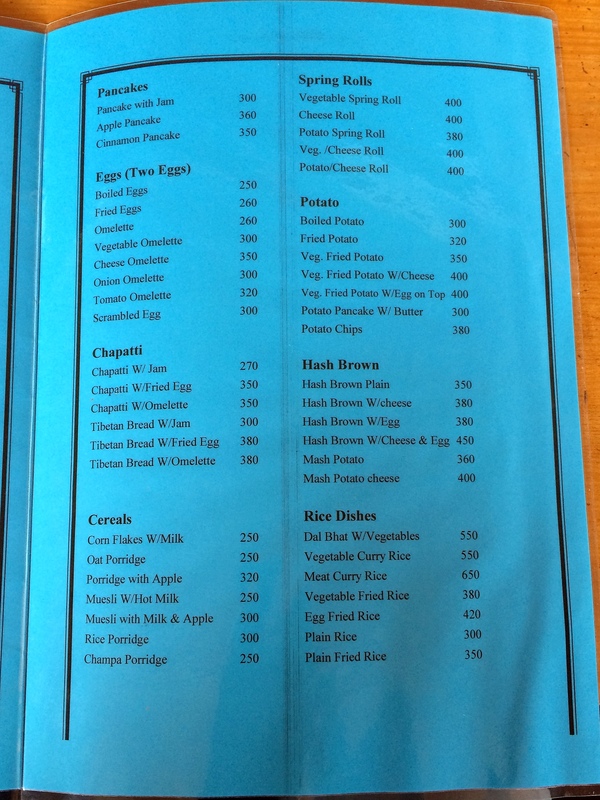 Sherpa Land Lodge & Restaurant (Khumjung) menu. hat diet as inferior in physical strength compared to the meat eaters. Well, come to this region as see how Sherpa’s climb the most difficult peaks in the world fueled by this simple and delicious meal. 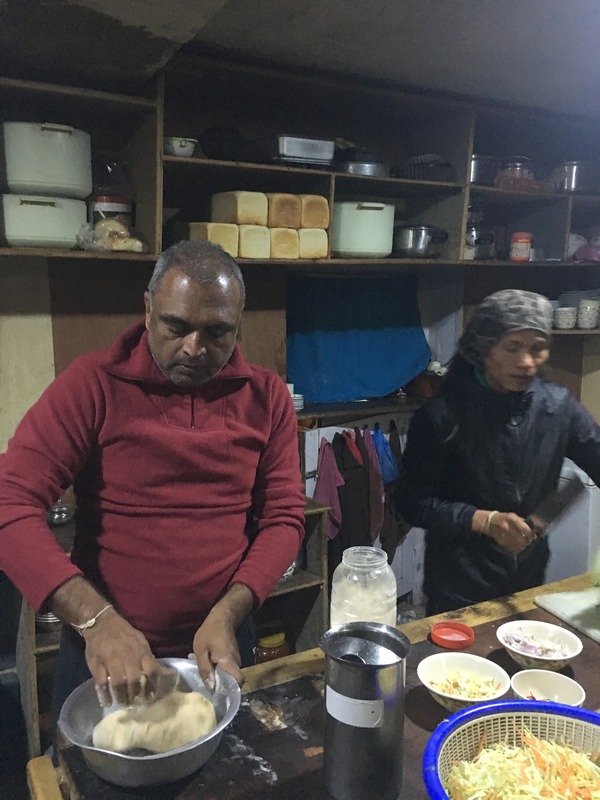 Dal-Bhat is so much embedded in mountaineering culture that Sherpa often describe the difficulty of any trek by the number of Dal-Bhat meals needed to accomplish is, such as “2 dal-bhat climb” or “3 dal-bhat climb” based on the energy needed to complete it! In my opinion, this simple and delicious meal provides a complete balanced diet of carbs, protein, fibers, vitamins, and flavorful spices. The kitchen was managed by sherpani (sherpa woman is called sherpani) and her daughter who graciously to allowed us to hangout in the kitchen and chitchat (we all speak Hindi). Kitchen was the warmest place as stove in the main dining room was not fired during mid-day. 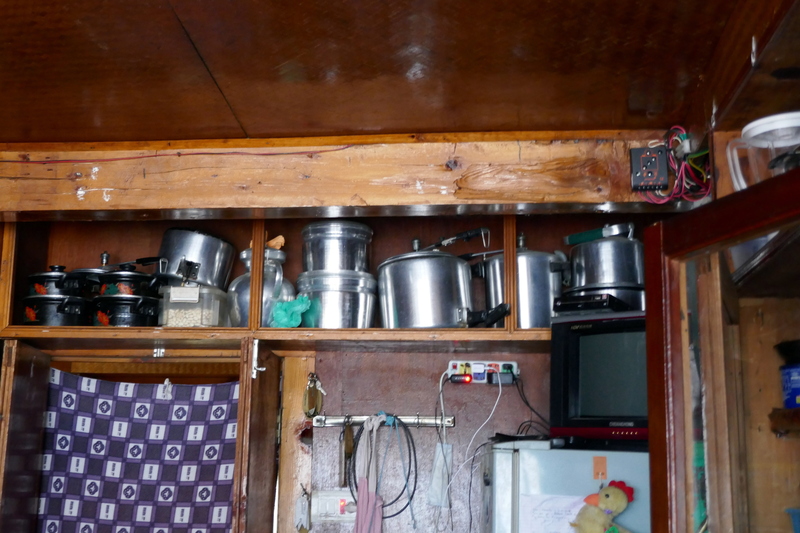 The small kitchen was packed with cooking utensils, pressure cookers, dishes, and we even spotted a small refrigerator and microwave!. It started raining while we were eating lunch so we got our rain gears ready before leaving for our return trek to Namche Bazaar. This was the only day and time I needed my rain gears throughout the EBC trek. Apparently there are two routes to return to Namche Bazaar, one is extremely steep compared to the other one. Tshering and I took the less steep route while others didn’t know about it so they were on a steeper trek.They stopped at a Sherpa Museum on their way back whereas Tshering and I went to Namche Bazaar to look for my camera stuff. The museum had displays about sherpa homes and pictures of notable sherpas and other climbers, and of course Everest expeditions. Mingma Sherpa (we met him at Kathmandu airport while renting a helicopter, see my writeup from Day 1) and his brother were also featured at the museum for their achievements. Kamlesh and I ran into a group of cheerful vendors selling jewelries and souveniors along the Khumjung street. After knowing we speak Hindi, they started singing a famous Bollywood song “Bambai Se Aya Mera Dost…”. (My friend has come from Bombay..). We chatted with them for a while and bought a couple of souvenir items. Kamlesh with cheerful vendors at Khumjung. 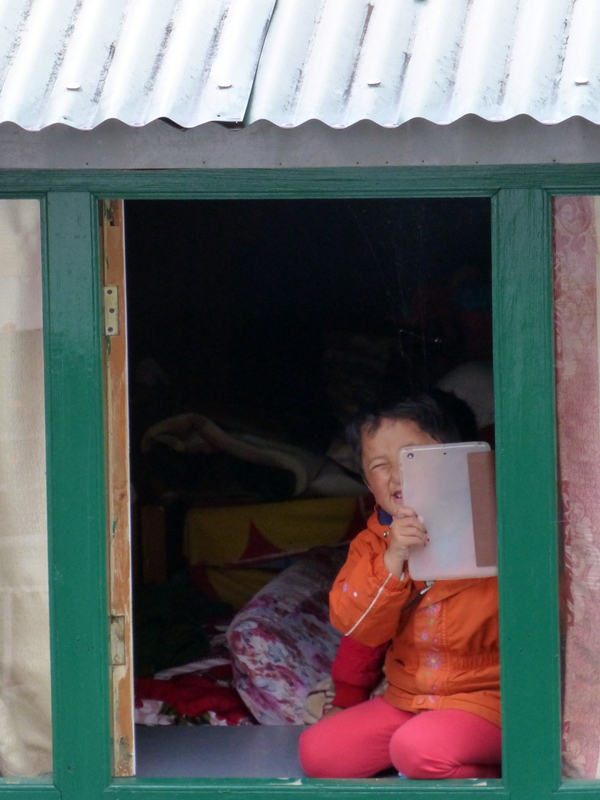 On return trip to Namche Bazaar, Rush spotted a pair of sherpa brother & sister playing with their Ipad and had a reciprocal photos session.Very cute! 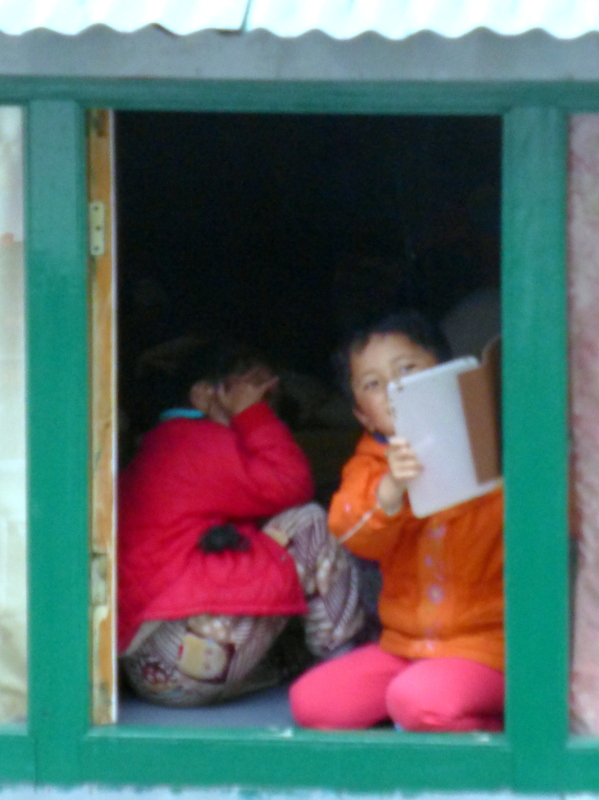 Tshering and I came to Namche Bazaar where he took me to his friends shop to look for my camera battery and SDHC card. The sign on the shop read “Snow Lion Money Exchange” but he carried some camera accessories, including to my surprise the high-speed SDHC card suitable for recording 4K videos on my Panasonia Lumix ZS100 camera! He only had one 32GB card and it was exactly the one I wanted so I immediately bought it for US$ 40. I was happy to find this card to keep me clicking for the rest of the trek. 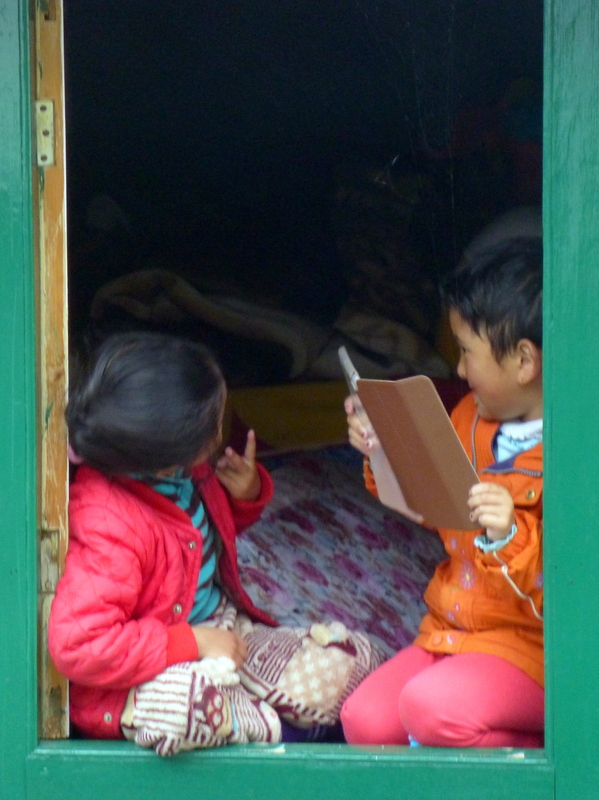 We connected with our other team and explored Namche Bazaar before returning to our hotel. Namche Bazaar is the best place to by gifts and souvenirs to take back home. The biggest challenge for me buying anything from here is the weight issues during the trek as well as helicopter ride back to Kathmandu. As always, there are things you want and things you need! The dinner tonight was fun. Our guide Deepak made arrangements with the hotel staff to for us to cook some delicious Indian food in their kitchen. Doctor made spicy potato sabji, Kamlesh and I made chapati. There is nothing like finding your favorite/familiar food on the trail.